Need a new water heater but don’t have enough storage room for a new water heater tank? If you’re tight on space or want to save space for something else you have in mind, you should get a tankless water heater. Tankless water heaters heat without the use of a storage tank which means there is no storage area to keep hot water. They do not produce the energy losses affiliated with storage water heaters. When tap water is turned on cold water travels through the pipe. Either a gas burner or an electric element heats the water for a continuous supply of hot water. 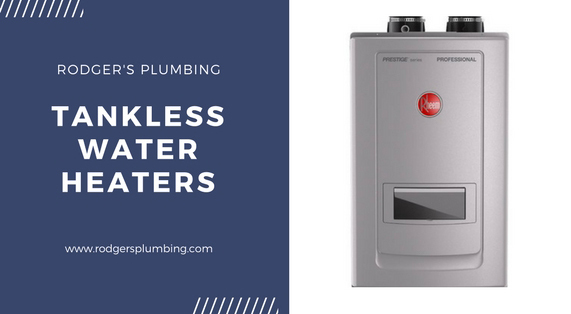 Some advantages to a tankless water heater are that it is energy efficient, space saving, longer lifespan than conventional tanks, no cold showers, and continuous hot water. Although there are a lot of advantages that outweigh the disadvantages of a tankless water heater there are a few things to keep in mind. The unit itself can be more expensive than a tank unit. The installation cost is also usually greater because of the changes that need to be made to the area when converting from a traditional tank. You may need to increase the size of the gas line to supply enough fuel to the unit. You may also need to add an electrical outlet for both gas and electric models.